Throughout North Africa and parts of the Middle East, couscous is regarded as the ultimate comfort food. Like rice to Persian cuisine or pasta to Italians, couscous is revered as almost sacred – a food to enjoy every day, and to dress up for special occasions. Deriving from the Berber word seksu, which means well-rolled or rounded, couscous resembles a whole grain like wheat or barley, but is actually a mixture of semolina (cracked middling of durum wheat), water, salt and oil or samna (clarified butter) that gets rubbed together until it forms small granules that are then steamed. Like snowflakes, every piece of hand-rolled couscous has its own unique shape and composition. Former President Habib Bourguiba of Tunisia was once asked to define “the Maghrib, “the culturally distinct—but geographically imprecise—western part of the Arab world. He allegedly replied that somewhere in Libya there was an imaginary north-south line. To the east of this line the staple food was rice, he said; to the west it was couscous. And it is at that line, according to Bourguiba, that the Maghrib begins. Bourguiba is not alone in his estimation of the significance of couscous. Among Algerians, couscous is called ta’am, the word which—in the rest of the Arabic-speaking world—means simply “food.” For all North Africans, couscous is part of one’s cultural identity, a food that is ceremonial, served at each of life’s milestones, and quotidian, “comfort food” par excellence. Its preparation and consumption are nearly always social events, and, while it is a dish common to all of the Maghribi countries, there are enough different recipes throughout the region to provide almost limitless variations on a single method of preparation and a narrow range of ingredients. The term “couscous” refers both to the dry, uncooked semolina pellets themselves and to the ready-to-eat dish of light, fluffy steamed grains topped by marga, a hearty vegetable-based stew. The Arabic word kuskus comes from the Berber seksu, which points to the dish’s presence in North Africa before the arrival of Arab Muslims in the 100 years following the death of the Prophet Muhammad in 632. But the introduction of new ingredients from around the world, as well as influences from Mashriqi (eastern Arab), African, Andalusian and even European cooking, has transformed couscous over the centuries, and resulted in distinct regional cuisines. Berber couscous, which is found mostly in the rugged mountain ranges of North Africa, is sometimes made with barley, or even corn. It is usually the dish at its most basic—and often its most delicious. The Moroccans have a reputation for subtly spiced couscous dishes that occasionally feature exotic ingredients such as pigeons or dates. Tunisians are said to do away with such niceties and opt for blazing hot couscous liberally spiced with peppers. Algerians, at the heart of the Maghrib, pride themselves on the authenticity of their unpretentious, robust couscous, while Libyans, at the eastern edge of the region, developed a variation that uses millet rather than the usual durum wheat semolina as its base. Within regions, further variations exist among villages and even from one family to another, depending on the availability of ingredients and the cook’s tastes and preferences. Couscous is most often made with lamb or chicken, but beef, fish, rabbit, quail or—in the Sahara on special occasions—camel are also used. Other recipes, meatless, rely on a rich variety of legumes. Some cooks toss a healthy pinch of saffron into their marga to color it a sunny yellow; others prefer the mellow red hues produced by adding handfuls of chopped tomatoes. Despite the differences, and even disagreements, over what constitutes “real” couscous, the method of cooking and presentation remains more or less the same everywhere west of the “couscous line.” Couscous grains are prepared in advance from semolina, salt, flour and water using a long, labor-intensive process. (See page 16.) In the kitchen, the dry pellets are steamed twice in a special utensil like a double-boiler that most North Africans call by the French term couscousier. Its upper pot, thekiskas, has tiny holes punched in the bottom, and nests snugly atop the lower pot (gdrah), in which the marga, the stew of meat and vegetables, is gently simmered. Steam from the sauce in the lower pot passes through the holes in the upper one and cooks the couscous, causing the grains to swell, lighten, and absorb the tempting aroma of the marga. The couscous is then served, in a sense, upside-down, as the cooked couscous grains—often with a bit of added butter to keep them separate—are placed in a large bowl and then topped with the stew. Extra stew sauce is served in a separate bowl, from which those who prefer their couscous wet with broth may spoon it on. For the brave of palette, hot pepper sauce (harissah) may also be served. Couscous is a complete meal in itself, generally followed only by fresh fruit such as grapes or melon, whose cool sweetness provides an interesting counterpoint to the rich, spicy sauce. There are, of course, variations. One dish, called burkukis in Algeria, mhammsah in Morocco and tikhemmezin by the Tuareg nomads of the Sahara, uses couscous grains twice the size of the usual ones. Another recipe, Known variously as sfuf, mesfuf orsiffah, is sweet rather than savory, and is often served in the heat of summer. In it, plain steamed couscous is topped with raisins and sugar, decorated with cinnamon and sometimes garnished with sliced boiled eggs. Sfuf is usually served with buttermilk or laban (yoghurt), whose acid edge cuts the sugary taste of the sweetened semolina. Besides its nutritional value for the body, couscous is also food for the North African soul. A steaming platter of couscous is always sure to evoke memories of friends and family, and since it is often served during special events, it also brings up recollections of past celebrations. In many Maghribi families, the week is not complete without a bowl of couscous served on Friday afternoon, after the Muslim congregational prayers. During Ramadan, sfuf with buttermilk is often eaten at sahur,the pre-dawn meal taken before the day’s fast. Likewise, the end of this month of daytime fasting is heralded in many households by an elaborate couscous. And some two months later, part of the lamb sacrificed during the ‘Id al-Adha, which marks the end of the pilgrimage to Makkah, may likewise find its way into a marga atop couscous. In Algeria, a new mother is traditionally given burkukis following childbirth, to help her regain her strength. And when a newborn child is named—traditionally on the seventh day of its life—this occasion, too, is marked by a special couscous, this time a spicy stew based on chickpeas and fava beans and known as gsaa, after the concave wooden or clay platter on which it is served. Later in life, heaping bowls of couscous will accompany the celebrations marking a boy’s circumcision; it is also often served at weddings, where several hundred guests may dine. At death, it is customary for neighbors to bring a bereaved family dishes of couscous to help feed visiting mourners. In fact, it is difficult to find an important occasion in which couscous does not play a part. Because of these special associations, North African emigrants have taken couscous with them wherever they have traveled, and some of today’s best couscous is served not only in Marrakech and Meknes, but also in Marseilles and Montreal. When piping-hot, spicy marga is ladled over a golden mound of couscous, Maghribi expatriates are transported home, even if just for a moment. Socially, through each stage of preparation and consumption, couscous is a powerfully communal food. “Couscous for one” is not just impractical: Most Maghribis would find it an absurd, alien idea. The time and effort involved in preparation of the dish make it the opposite of fast food, and couscous is generally made in quantities to feed not only the immediate family but also a bevy of aunts, uncles and cousins—and often the neighbors as well. From the beginning, couscous is a group effort. 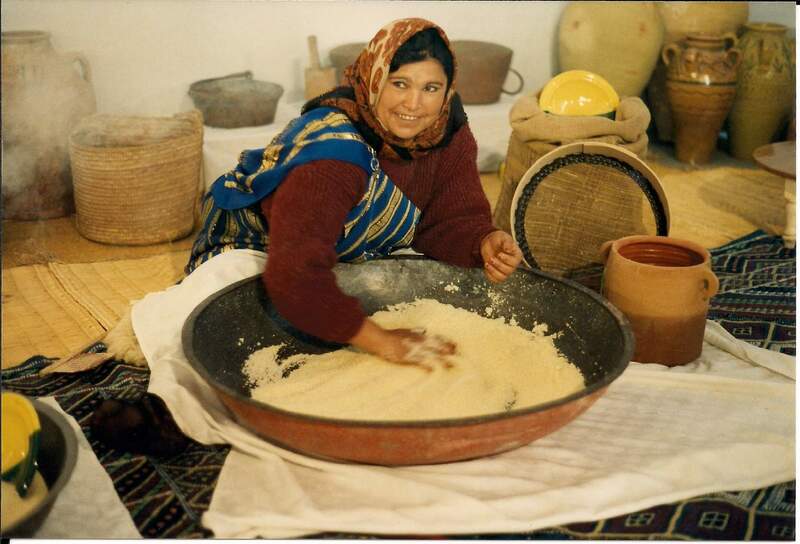 The traditional preparation of the grains—rolling the semolina with water and salt, sifting and steaming the grains and then spreading the couscous out to dry—takes three or four people all day to accomplish. Women from an extended family will generally come together two or three times a year to prepare couscous grains, going through one or two 50-kilogram (110-lb) sacks of semolina at a sitting. After the grains are prepared, each household will take home its share of the finished product, which can be stored almost indefinitely. Despite the hard work, the preparation takes on a festive air. This is a time when women catch up on family news, tell jokes, listen to music and dance for one another. Tradition charges the youngest woman in the group with preparing coffee, tea andm’semmen, a pastry made by frying small semolina-and-flour cakes and drenching them with honey. Although some North Africans, especially those in cities and abroad, now buy factory-prepared couscous in boxes—it can be found in many supermarkets in the United States and Europe—the traditional method remains common across the Maghrib. The consumption of couscous too is communal. One big bowl of cooked couscous is set on the table, and everyone digs in with a hand or a spoon. The eldest diner at the table, or a special guest, is likely to have the choice bits of meat and vegetables slipped over in front of him or her. And no matter how much couscous one consumes, it always seems impossible to make more than a small dent in the mountain of semolina and stew! But couscous often embraces a larger community than the family. Many households set aside a large bowl for the less fortunataiin the neighborhood, while others occasionally send a big helping of couscous to the local mosque to be consumed by the worshipers following Friday prayers. North Africans feel that couscous, like bread, contains barakah, a blessing, and while it is certainly delightful to be the recipient of a delicious bowl of couscous, it is even better to give than to receive. The Maghrib, like all the world’s distinct yet multicultural regions, is filled with great contrasts. It boasts rich farmlands and barren gravel plains, burning deserts and snow-topped mountains, isolated oases and overcrowded cities. Its people speak variations of Arabic all their own, often interlaced with heavy doses of French or Spanish, and sizable minorities have one of several Berber dialects as their native tongue. Among Maghribi governments, there are several republics, one kingdom, and even a unique “socialist peoples’ Arab jamahiriyya.” Yet whether they are Arab or Berber, rural or urban, or live in Tangier, Tunis or Tindouf, couscous, in its almost infinite variety, is a common touchstone for North Africans. When taking the measure of the Maghrib, one could do worse than to borrow Habib Bourguiba’s couscous yardstick.